Summary for the Busy Executive: Music to kick back by. It turns out that two of the oldest instruments in the world go very well together. The music written for them generally shows an attractive intimacy, which the works here don't belie. Robert Beaser has unfortunately come off as a fine craftsman amounting to very little in other works I've heard. Paula Robison and Eliot Fisk, the dedicatees, performed the complete Mountain Songs, arrangements of traditional tunes, for the Musical Heritage Society (still available, by the way). I found the complete set a bit dull, but these excerpts fare much better: "Barbara Allen," "The House Carpenter," "He's Gone Away," and "Cindy." Hawley and McFadden have skimmed the cream, and to me this pruning gives the set considerable life. Constant Lambert once wrote that the only thing you can do with a folk tune is to repeat it louder. Not quite the truth, it nevertheless points to the danger of working with material in which the music doesn't change from stanza to stanza. A folk tune depends for much of its variety on words and story. When you take these away, what can a composer do to make up for the lack? Rarely is the tune in itself so good that it can bear all by itself more than two repetitions. For variety, Beaser inserts subtle changes in the accompaniments and in the melodies themselves as well as extended, related interludes between stanzas. With the sure-fire slow-fast-slow-fast progression of movements, this becomes one attractive set. The time has come to stop regarding Joan Tower as a woman composer. She's a composer of considerable strength, when she puts her mind to it. For me, her work divides in two: music that proceeds "pictorially," and music that proceeds by "narrative" or argument. In general, I greatly prefer the latter, since her pictures often make for static music. Snow Dreams does have its inspiration in a scene, but it doesn't bog down. First, it captures the crisp isolation of winter, where the mental ear becomes sensitive to every sound. Second, she finds and exploits the tonal variety in two fairly limited instruments, and she creates, in my opinion, the most sophisticated and complex conversation between the two parts. Each player gets a couple of extended solos as well as ensemble passages. The opening phrase, for solo guitar, repeated twice, calls for three different colors. Yet at no point does Tower take the easy way out by resorting to the bizarre. The atmosphere throughout a fairly long movement is meditative, and yet interest never flags. Many consider Terry Riley, along with LaMonte Young, one of the founders of Minimalism. Certainly, Riley's In C may be one of the most influential compositions of the postwar period, a milestone in the breaking up of postwar dodecaphonic hegemony. Steve Reich and John Adams have acknowledged its inspiration. 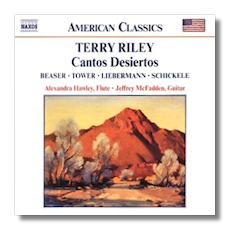 Cantos Desiertos shows the composer three decades later, mellower, less aching to prove something and more interested in making music. The Cantos consist of dances inflected with Latin-American rhythms: samba, tango, and so on. Minimalism has left its traces in the simplicity of structure, the paring down of notes, the ease with literal repetition (although not maniacal repetition). I can pay the score no higher compliment than to say that these dances sound like Latin music written by an insider, someone so at home in the idioms that he avoids the obvious cliché or boilerplate imitation and instead can play around in the neighborhood. Like much of neo-Romantic Lowell Liebermann's music, the ambitious Sonata for flute and guitar – another Robison-Fisk commission – demands great virtuosity from the players in both of its movements: a nocturne followed by a gigue. Unfortunately, I simply don't care. The music seems to me second-hand and facile. I miss a personal point of view or a strong personality behind the notes. Peter Schickele's Windows, on the other hand, does much more with fewer means. The composer wrote them as a wedding present to his brother (a violinist) and his bride (an amateur on the guitar). The guitar part proved too difficult for his sister-in-law, and Schickele arranged the piece twice, once with flute and again for clarinet. Schickele has always struck me as carrying a torch for the musical enthusiasms of the Sixties: jazz, soul, blues, Renaissance and Medieval, folk (traditional, world, and modern urban), Baroque, and Ives, as well as the beginnings of HIP performance. Windows exemplifies these loves with a modal "Pavane," an urban-folk "Cantilena," and a "Refrain" that evokes African music. The pieces are short, but pungent. I find the "Pavane" especially beautiful. This is, I suppose, neo-Romanticism, but one without an agenda. Hawley and McFadden are a sensitive duo. McFadden, an extremely musical guitarist, lets you hear music, rather than guitar-playing. Hawley plays her flute at the same level. They advocate the virtues of all these pieces and indeed more strongly than the formidable Robison and Fisk in the Beaser. The Tower, the most substantial piece, fittingly receives the most thoughtful account. Overall, the CD puts out a relaxed vibe, just the thing to fire up in the evening after a hard day at work.